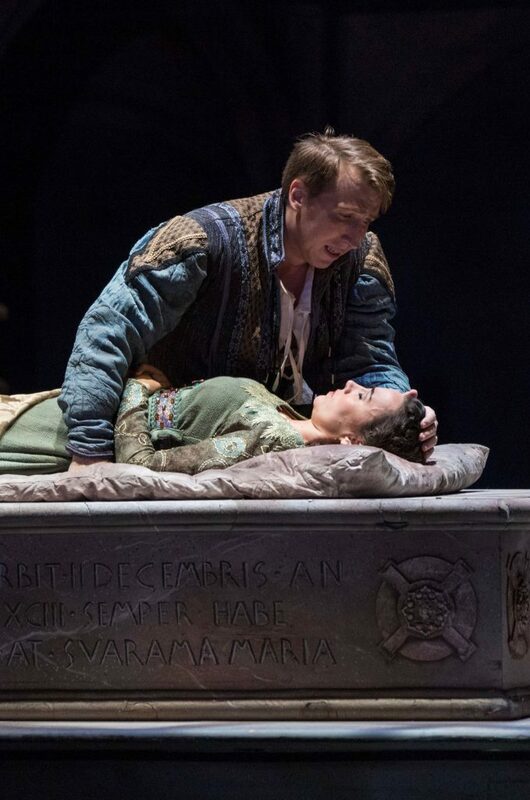 Shakespeare’s tragic love story returns to the Utah Opera stage to open the company’s 2018-2019 season. Composed by Charles-Francois Gounod with libretto by Jules Barbier and Michel Carré, Utah Opera Chorus Master Michaella Calzaretta and Conductor Robert Tweten come together musically to deliver a stellar production sung in French by a cast of 54 supported by the 53-member Utah Symphony. With the longstanding feud between the warring houses of the Montagues and the Capulets on full display in most scenes, the young lovers Romeo (Joshua Dennis) and Juliette (Anya Matanovic) throw caution to the wind as they fall in love and decide to marry. The on-stage chemistry of Romeo and Juliette is critical to any staging of this opera and Dennis and Matanovic perform admirably. From their secret rendezvous on Juliette’s balcony to their final “Poison” aria, their duets lift each other beautifully while their physicality exudes authenticity. Matanovic’s strong soprano voice wraps itself around the audience from her first note and holds their attention throughout the three-hour performance including the captivating “Waltz” aria. Dennis also delights in the growth of his character. “I really love the progression Romeo makes musically. His music gets more and more powerful and heart-rending as the opera goes along.” He has mastered the balance between love-stricken wooer and the demands the pressure-filled tenor role ask of him artfully. Aside from the headline roles, Adam Lau makes his Utah Opera debut as the thoughtful Frère Laurent who agrees to marry Romeo and Juliette and then helps Juliette escape a forced marriage to Count Paris and stuns with his bass vocals. Mezzo-soprano Megan Marino returns to the Utah Opera stage in the playful pants role of Stéphano, Romeo’s page, and delivered the “Que fais-tu” aria with effortless perfection. 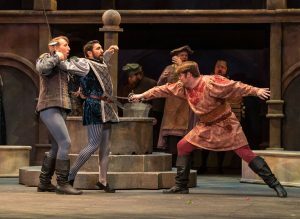 Rivals Christopher Oglesby in the tenor role of Tybalt and his feisty protection of the Capulet dynasty and baritone Efrain Solis as Mercutio, Romeo’s second, lend plenty of drama and talent to the production—notably Solis’ rendition of the “Mab” aria. Although Gounod’s adaptation of the iconic classic of the romantic tale is perhaps the most frequently performed, the opera concludes with no acknowledgement of the tragic cost of the warring factions of the Montagues and Capulets—unlike Bellini’s Italian I Capuleti e i Montecchi. Utah Opera’s Romeo et Juliette continues Friday, October 19 at 7:30 p.m. and Sunday, October 21 at 2 p.m. at the Janet Quinney Lawson Capitol Theatre. Tickets are available here.